Dear readers, the fate of this year’s Readers’ Choice award lies in your hands. 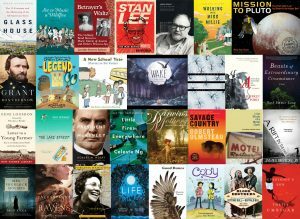 Yes, YOU can cast YOUR vote to decide which of the incredible books nominated for the 2018 Ohioana Book Awards will be THE book, the ONE book to win a very special kind of nod. Ohioana began this program in 2016 to celebrate the 75th anniversary of our awards program. This year, we have a poll that will stay open until Friday, June 29, at 3:00 p.m. You can access the poll here to vote for your favorite of 30 available titles. One vote per computer, please. Our winner in 2017 was Tiffany McDaniel for her novel The Summer That Melted Everything. For 2016, the winner was Mary Doria Russell for her novel Epitaph: A Novel of the O.K. Corral. The Readers’ Choice award is a great way to include more people in the process of giving awards to those who richly deserve them. We hope you will vote for your favorite too!